I don’t know what possessed me the other day, but there I was, and there it was—I was faced with a big mound of Iceberg lettuce heads at the market, two for one euro, so I bought two of them. Although I don’t eat it very often, I love Iceberg lettuce salad and anyone who says they don’t is probably fibbing. People will often justify their disdain of Iceberg lettuce on nutritional claims, but in reality, leafy green salads in general doesn’t carry that many nutrients. Think about it; if you steam a plate of those fancy mixed greens, after you get rid of the water and they’re cooked down, it equals about one tablespoon of vegetables. So if you’re looking to get healthy, eat green vegetables like broccoli and asparagus. And since you’re being so prudent, you can allow yourself to bring on the blue cheese and bacon! 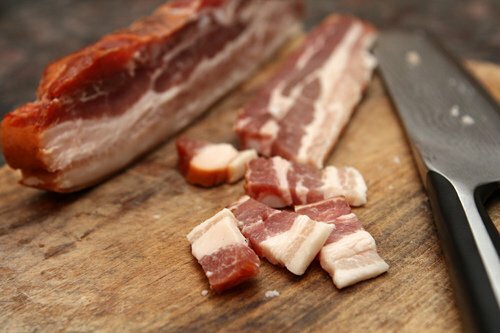 I’ve not seen a French person get all frothy at the mouth over bacon, which is partially because they just eat it and don’t make a big deal over it. But another is that they don’t cook bacon until it’s crisp. 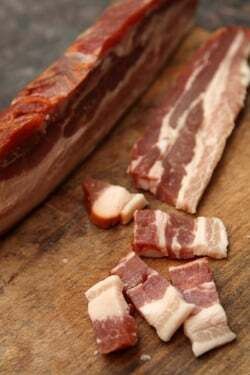 I bought this beautiful poitrine fumé (smoked bacon) when I was in the Jura and was happy to slice it into lardons and fry the rectangles in a skillet until they were very well done, just on the edge of burnt. So I had a little explaining to do when I make this salad for Romain. First up was explaining l’Iceberg to him. Then I had to continue with a difficult translation on why I was pouring cheese sauce on salad. The bacon, however, he had no trouble understanding since he discovered unlimited crisp bacon at a breakfast buffet in the Bahamas. I had to give him a lesson in rummaging around in a chafing dish and fishing out the best pieces, but he was a quick study and before I knew it, the pupil had outdone the master and I realized I had to get there quickly before he did on subsequent mornings. I’m not sure blue cheese dressing, or bleu cheese dressing, is going to take hold in France. But there’s no shortage of excellent fromage bleu around here, and Iceberg lettuce is obviously rather available. 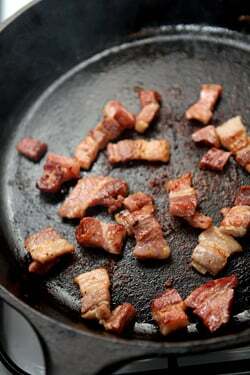 Plus what’s not to like about lardons of extra-crispy bacon? So I don’t see any reason why not. If you can’t get buttermilk, mix one part milk (whole or lowfat) with one part plain yogurt (regular or lowfat) to approximate the taste. 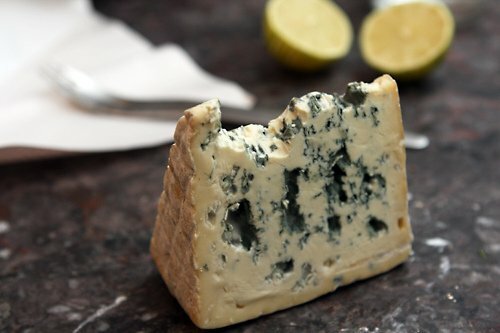 Any kind of blue cheese, domestic or imported, should work well.The touch of red wine vinegar gives the dressing a little extra acidity, and if you don’t mind the faint pink color, you can use that in place of the lemon juice or white wine vinegar. I like chunks of cheese in the dressing but if you want it smooth, feel free to run it through the blender or food processor.Another excellent use for blue cheese dressing is to mix a salad of grated raw vegetables; carrots, radishes, avocados, cabbage, and kohlrabi, and with perhaps additional fresh herbs like chervil and tarragon tossed in as well. 1. In a medium bowl, mash the blue cheese with the salt and pepper with the back of a fork until the pieces of cheese are finely broken up. 2. 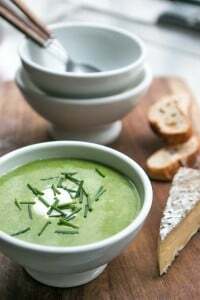 Stir in the chives, sour cream, buttermilk, and lemon juice or wine vinegar until well mixed. 3. Add a few drops of red wine vinegar. Taste, and adjust any of the seasonings to your liking and if the dressing too thick, add a bit more buttermilk. Notes: For those in France, I used lait ribot (buttermilk) and fromage blanc for the sour cream. Serving: Spoon over wedges of very cold Iceberg lettuce or use as a dip. Garnish with additional chives, crumbled or sliced bacon, and some freshly ground black pepper. Storage: Blue cheese dressing can be made up to three days ahead and refrigerated. This post just screams “American” at my Australian mind, and you know what? I’ve never been so happy to be yelled at. Bleu Cheese dressing on iceberg lettuce is one of my guilty pleasures. I’ve served it to other Americans (we live in Antwerp, Belgium and visit Normandy, France frequently), but have hesitated to serve it to French and Belgian friends. Your recipe looks much better than the one I culled from an American cooking magazine a couple of years ago, which called for mayonnaise instead of buttermilk. Thanks! I always remember a restaurant review on NPR (American public radio) in the early 1980s. The reviewer was at a French restaurant and remarked that he was surprised that the blue cheese dressing used an ordinary blue cheese rather than Roquefort! Which told me that it wasn’t a French restaurant, and also told me that the reviewer knew nothing about French cuisine – or Roquefort for that matter. But I love, love, love blue cheese dressing on iceberg. Now I just have to persuade my iceberg-hating husband to let me try this recipe. Or wait till he’s out. Even as a blue cheese-phobe I want this for lunch right now. Bleu cheese reminds me of my dad; it’s one of his favorite things to eat in the world. Bleu cheese on iceburg with bacon?! Now that’s one of MY favorite things to eat in the world! I have been wanting to make a good blue cheese dressing for a while and I am SO happy to see a recipe for it on your blog. Thanks!! You bought TWO heads of lettuce? I always wonder where you store things in that tiny kitchen. If they’re priced two for a euro, can you not get one for 1/2 a euro? I like a wedge of iceberg with blue cheese now and then, but if I bought two heads we’d be eating it for days on end and I’d be tired of it before I finished it. Joan: I have no idea why people put mayonnaise in blue cheese dressing. 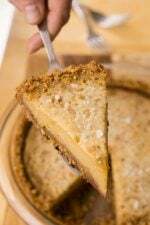 The sour cream adds a nice richness and tang, and the buttermilk adds additional zing. Cal: Roquefort is wonderful cheese, but I’ve made this with several types of blue cheese including fancy Bleu de Gex, and found it was best with the regular fromage bleu one gets pretty easily, and it’s about half the price of Roquefort. I always enjoyed bleu cheese dressing in NYC. Since moving to France, I tried making it, but the horrid recipe used a base of vegetable oil (from my normally trustworthy Fanny Farmer cookbook)! Didn’t think it was possible to dislike something that had bleu cheese in it, but this dressing was despicable. Your recipe sounds exactly like what I want: tangy, creamy, and bleu cheesy. Fromage blanc is an ideal substitute for sour cream. We were so happy to find thinly sliced bacon here after many years. 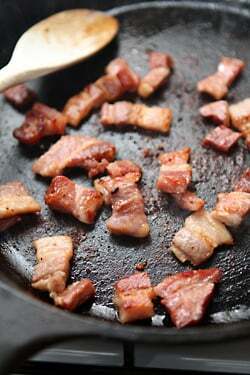 Lardons (though they are unbeatable in tarteflette) are just not the same as delectable crispy bacon. David, Your blue cheese dressing looks scrumptious.I got a huge chunk of Stilton sitting in the fridge.I’m thinking it would be great in your dressing recipe. Oui ou non? As a child my favourite salad dressing was the smelliest blue cheese a restaurant could provide, albeit an unlikely choice for a six year old. Today, my tastes have not changed, bring on the blue cheese…. Ha! I have a head of iceberg lettuce sitting in my crisper drawer right now just waiting to make wedge salad – it will be waiting no longer. That dressing sounds just perfect. Thanks David. 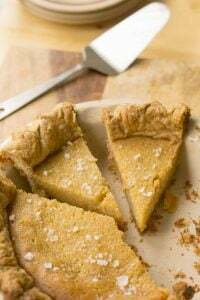 i love that this recipe uses buttermilk and sour cream! i’m usually turned off by dressing recipes that start with copious amounts of mayo, since i’ve just barely talked myself into liking it. looking forward to a wedge salad this weekend after a long week of travel, and i couldn’t agree more with your post on comfy sheets in hotels. I am excited abt this recipe… I LOVE iceberg lettuce and silly me, while I often enjoy wedges of it when I am not in the mood to prepare a whole salad for dinner, I have never enjoyed it wedged WITH DRESSING! Cannot wait to try this over the weekend! Gracias! Had not thought about making blue cheese dressing in a long, long time! Actually, I’m writing to tell you that your rosemary cookies with tomato jam I posted about were a huge hit with company. One of my guests ate so many of them, he actually ruined his appetite for dinner. I had kids there and just said it was “jam” because I figured they wouldn’t try tomato jam–and even the veggie hater loved it! I haven’t had authentic bleu or blue cheese dressing in like forever. Why? I don’t know, but I’m going to have some as soon as I can gather the ingredients for your dressing and the bacon, oh, the bacon. That really puts it over the top. My immigrant family didn’t have enough money to go out to dinner when we were growing up in NorCal. I didn’t go to my first restaurant until I was in my teens with friends. I didn’t go to my first steak house (not a fan of steak) until I was in my 30s last decade as part of a business dinner. When I ordered a “wedge” salad, I stared at it for a few minutes, not knowing how to eat it. I honestly had no clue what the proper etiquette was. Do you tear it apart with your fingers? Do you pick up the dry part and eat it like a folded over pizza? Thankfully, a coworker saved me from embarassment in front of my VP. I truly had never seen lettuce served like that. It was divine, by the way. I’m sure they used buttermilk and not mayo. I just loove an iceberg wedge salad w/blu cheese.Thanx for the recipe. Anyone have any experience using gorgonzola? that’s what I have here and while i’m not complaining, I don’t know if would would mix it with anything else? Sometimes you just need the cold, crisp of iceberg lettuce. Topped with blue cheese dressing makes it that much more delightful- and decadent! Your dressing recipe seems much easier than the ones I tried. I usually just use vinegar to make my buttermilk, but I love the idea of using yogurt. I wonder if creme fraiche would work too. Thank you for sharing this! 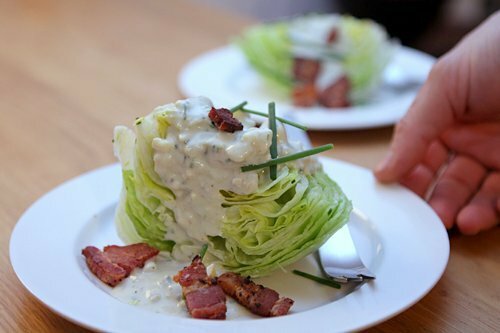 I was in the US for Christmas this past December and had an iceberg wedge salad with bacon and blue cheese and made a mental note to figure out how to make it when I returned to Paris. I knew that poitrine fume would be perfect for the bacon but wasn’t sure how to make the blue cheese dressing so you can imagine how glad I was to see your post today! Am tempted to run out and buy all the ingredients now. I have been re-discovering blue cheese lately. Even since I visited Cowgirl and had the Point Reyes Blue. I just ate my last bit of Valdeon last night and now you post this. Might be time to make some phone calls to a few cheese shops and see who might be willing to ship to Fairbanks, AK. So American! I’m serving it in Norway tonight with cod fish sticks and garlic mashed potatoes. Found organic blue cheese at Ikea : ) Thank you once again David for telling me what to make for dinner. I used to go to a steakhouse after shopping trips with my Mom and always looked forward to their salad made out of iceberg lettuce and blue cheese dressing (they added a single anchovy instead of bacon) — that was years ago and since then of course iceberg has fallen out of favor. It’s nice to see someone like you talking about it again and I can’t wait to try your recipe — it looks perfect — thank you David! I had to laugh and your right, anyone who says they don’t like a good wedge w/blue cheese is just a fibber. 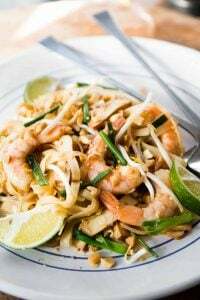 I like the tartness in this recipe and can’t wait to try it. Alone of course. I got my head turned away from iceburg lettus years ago when the foodie establishment at that time poo-poo’d it as being too bland and too low brow! I was not much of a salad lover in those days anyway because I thought iceburg was just like eating crunchy water. But as a vehicle for good dressing, it was unsurpassed! I always cut the ribs for myself while making everyone else a salad and used them as a scoop for my favorite Bob’s Blue Cheese! Melissa, you made me LOL with that line! I made hot wings this weekend at my kids’ request, and whipped up a bowl of bleu cheese dressing/dipping sauce to go with them (my request). Since there’s still quite a bit of dressing left, and I just happen to have some thick cut bacon and a romaine heart, I know what I’m having for dinner tonight! David, this looks so delicious! Thanks for the meal time inspiration. Have you tried steam/sauteed Romaine lettuce? It is much like spinach and does not become slimy like iceberg lettuce does when it is cooked. The Italian truck farmers in the Seattle area used to curry my favor with heads of Romaine until I said – no more salad. They looked shocked and said, no, you cook it like spinach with a little bacon and vinegar. YES! What a treat. It is sweet and has none of the bitter tang that spinach has (which I do like, though). Also, you mentioned tomato jam. My grandmother made tomato preserves with tomatoes, sugar, onions and slices of lemon. Is this similar to your recipe, and where can I get it? I cannot find her recipe anywhere – it’s just a 50+ year old memory at this point. 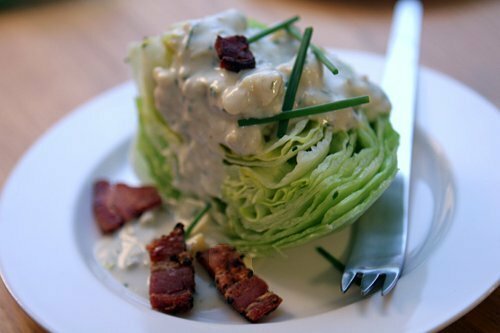 I love iceberg lettuce wedges, I love bacon, and I love blue cheese dressing…can’t wait to try yours! I like to sprinkle some thinly sliced green onion on such a salad as well. I came to your website seeking a Madeleine recipe…and found dinner instead (or, too). Looks delicious! Love how in France no salad is complete without meat, be it lardons, gesiers or jambon. I always have to warn my guests when they say “I’ll just have a little Salade Gasconne” that it is more a charcuterie plate with a bit of green hiding somewhere. Now I just want to know- who is growing the IJsberg lettuce and where? love to get some seeds for my potager. Thanks for the dressing recipe David. Oh my. I am most definitely happy to see this. Perfect. I love blue cheese dressing but of course here in Germany they know blue cheese and NOTHING of blue cheese dressing. You order a salad and you get the dressing, whatever it is! My old recipe used mayo + buttermilk and was never quite right. This sounds great and we’ll check it out personally this weekend! Delicioso aderezo de queso para esa lechuga iceberg y esa tocineta. Sarah@5:59 – look at recipes for Cranberry Gorgonzola Tart. WHY is the wedge salad so good? I can remember my first one as a child which I think is a rather unusual thing to keep in the memory bank. Thank you for the dressing recipe. I have a good bit of blue from Oregon that is waiting for something to do! David, this dressing recipe is delicious! Thank you. Sarah + Joan: You could likely use another ‘blue’ cheese for this although if you have something fancy, you might want to save it for eating on it’s own. I’ve made it with regular bleu d’Auvergne and Bleu de Gex, but if you experiment with others, let us know how it turns out. Stephanie; I know! He loves eating good food, and enjoys when I cook other cuisines for him (which, as you know, is not always the case…) He likes Korean, Japanese, and even Mexican if it’s not too heavy. All that stuff like Kraft Mac & Cheese that we think is funny, though, he’s not all that convinced about. But he loves Rice Krispie Treats! Nancy: Glad the recipe was a hit. It’s a bit goofy, but it tastes good–the combination of the two. Lynée: Thanks…now I’m hungry for fish sticks! They do sell them at the fish markets here (poisson pané), and instead of rectangles like in America, they’re in the shape of fish. Well, sort of. Hope you made some tartar sauce to go with those fish sticks! I know you’ve written about never cutting lettuce and never putting down your fork while eating salad in France but the iceberg looks to be a significant logistical challenge even if its scale is not as grand as an American-grown specimen. You just made the best dish for me! I love blue cheese, bacon and iceberg! Oh i think i would make it tomorrow if only i had all the ingredients. Unfortunately, we don’t have buttermilk or sour cream in Greece. Is there a substitution for sour cream too? I ‘came out’ confessing my love for iceberg recently. I serve mine with ranch dressing and grated parmesan. I’ll try the blue cheese and bacon next time. I tried this with gorgonzola dolce and it is divine. Really? Huh, I guess I’m mostly alone here, but iceberg lettuce just bores me. Like crunchy water (hence then name, mayhaps). I’d prefer that amazing looking dressing dressing and tasty tasty bacon over a mound of baby spinach any day. Still, I do like the aesthetic of the wedge, which can’t be achieved as nicely with my other favorite leafy greens. And it does have that distinctive crunch. And although I’d eat iceberg lettuce if I liked it more, a cup of raw spinach has more vitamin A than a cup of broccoli or asparagus. Just sayin’. Thank you! I can’t imagine life without my beloved bleu cheese dressing. I’ve branched out since my days of childhood refusal to allow anything but “le bleu” touch my salad plate and come to apprecaite a lovely vinaigrette as much as the next person. But bleu cheese will always be my favorite. Bacon and iceberg not withstanding, the highest and best use of the stuff, in my book, is graden fresh tomatoes and black pepper. Or live large and throw all four of them together – perfection! Oh how I love a wedge salad! I often feel embarrassed or guilty over my love of iceberg lettuce, but sometimes it just hits the spot! That dressing looks amazing as well. Crisp bacon. Why don’t some parts of the world get that? Anyway, I love this. You almost make it look highbrow. A few years back, trendy restaurants here were going retro with wedges of iceberg, usually topped with Thousand Island Dressing. A friend and colleague of mine used to work for the Iceberg Lettuce Commission and found it a challenge to promote the product. I love most any kind of blue cheese. I learn a trick for tossing it in salads from San Francisco’s oldest restaurant, Fior D’Italia. Rather than crumbling the cheese, which for me often results in it migrating to the bottom, shred it with the small shredding holes on a box grated. I toss the dressed salad with the shredded cheese, which clings to the ingredients, because the shreds are lighter than crumbles. My, I do go on! i remember having this at galatoire’s in new orleans 1973 when just a wee pup with my father! my first gastronomic experience…. Roquefort is highly over-rated. This is my recipe to a “T”, although I can’t help but tossing in a bit of minced garlic. Fresh lemon juice is essential as is buttermilk. This dressing is good on anything….greenery, meat, sandwich spread…………yum. 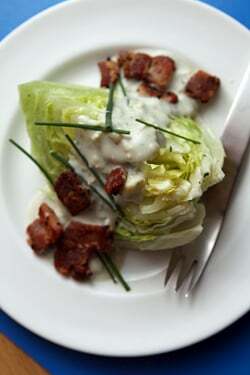 There is just something about iceberg lettuce, bacon or lardons, and blue cheese. I don’t know what it is except irresistable…You can’t help but order it in a restaurant.. The crunch, the salty sharpness of the blue cheese……Yummmmm………Whatever happened to Green Goddess? I can’t even remember what it tastes like….I missed the Bahama blog. Where did you go? Buried as I am in the frigid southeast USA, the Bahamas sound like a fairy land. I hate cold weather…..
I’m pretty sure the darker green leafy vegetables are far more nutrient-dense than iceberg lettuce. It seems odd that you’d try to suggest otherwise…especially when there’s nothing wrong with eating a bit of iceberg lettuce in the first place. I’d love to try this minus the bacon with gorgonzola! Iceberg lettuce is highly underrated. I make a spicy and crunchy Szechuan peppercorn salad with iceberg lettuce as a key player. A few fresh tomato cubes on your blue cheese salad wouldn’t be bad. My Mum used to say “you can eat all the iceberg lettuce (celery) you want…it is all water, no calories and minimally good for you.” It’s the dressing that makes it yummy good! Every once in a while, I come across a great blue cheese dressing and I find myself putting it on everything. The smooth, rich flavor is both powerful and comforting…quite unbeatable. I haven’t had a good iceberg lettuce salad in the longest. I could definitely use some right now, especially since it’s another great excuse for procrastinating on my 15 page art history essay (on one painting). It’s only 12:37 here, and I have to wake up at 3:45. Oh well . . . Question: where did you get that fork? Love it! fantastic. thank you! i’ve been on a quest at restaurants around the country for “the best” wedge….and now I don’t have to. if you know anyone who has a puppy, dogs love the heavy white center rib of a leaf of iceburg. you will have a friend for life! Do people really justify a dislike for iceberg based on nutrition? Because I base mine on taste. Or rather the lack thereof. You’re basically eating water. Of course I also detest ranch dressing and would only consider putting it on iceberg. Which means this recipe is incredibly appropriate. I wouldn’t consider using blue cheese with any other lettuce and I won’t allow iceberg in any of my salads with vinaigrette. I have a feeling that my French husband won’t like this salad-he is a huge fan of plain vinagarette. He doesn’t even like balsamic in it-but I’m going to make it next time we have guests. I have a bottle of distilled balsamic vinegar that I’m going to decoratively place on top and around the plate too. Me too, I like the crunch, and its simplicity… growing up, as a child, blue cheese was, and is my favorite cheese /dressing. David do you or can recommend a good recipe for homemade english muffins? Linda: That’s interesting that your French husband won’t allow balsamic vinegar in his salad dressing. Perhaps he’s not Parisian (?) because it’s become very trendy around here to use it. But for the record, I agree with him-I’m not a fan of it in dressings either. Amanda: I don’t quite get it either, how the ‘crisp’ thing is alluding people around here. There’s a trend toward baguettes pas trop cuite (“not too cooked”) and it’s nearly impossible to find crisp frites anymore, which is a shame. 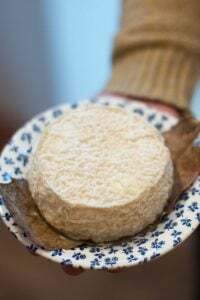 Claire: Also if you leave the cheese open in the refrigerator, exposed to the air for a few days, it’s dries out and is much easier to crumble. However for this dressing it’s simply mashed so no need for any pre-prep. Johnette: No, I don’t know of one. Try Dan Lepard’s site at danlepard.com. Iceberg lettuce, tastes bitter and to me is incredibly unpleasant. Its got nothing to do with appearance, or nutritional value at all. Blue Cheese fan here! That chunk of bleu you have there looks simply mouthwatering. When I can overcome the calorie count in this salad, I enjoy it immensely. Us girls have to watch that kind of stuff, unfortunately (sometimes). Last summer I quickly grilled some Romaine Lettuce, lightly coated in olive oil and made a similar salad. The charred lettuce was a delicious match with the blue cheese and the bacon. Nice variation when you don’t feel like the crunch of iceberg. bravo! one of my favorite american classics. David, I live in paris. Can I replace sour cream with creme fraiche? thanks. Oh this is so well-timed. I have a container of blue cheese and wasn’t sure what to do with it. Thank you! I love the blue cheese dressing!! I use it on top of broccoli. Is it my imagination, or has your photography taken a quantum leaf in the enticement factor? These photos positively entice me to eat them up — at the least to make this dressing — and I don’t even eat bacon. But there is a piece of blue cheese in the fridge, and now you have given me a new recipe for dressing besides the one in Joy of Cooking that calls for mayo. Merci. I first ate this salad at the Buckeye Roadhouse in Marin County – love at first bite. Somehow, a recipe for it appeared in Martha Stewart Living (my daughter’s subscription – really) – it just fell short. Can’t wait to retry with your recipe – and maybe splurge with the Cowgirl Creamery bleu – Thanks! Talk about Sin CRON is IT Y …….!!!!! Saturday night a freiend came home for dinner, she brought some blu cheese. We ate a bit and Sunday it seemed to me that 20 years had gone by since making the famous dressing! Thinking, “dare I beeeeee Seen purchasing iceberg lettuce.” I didn’t. In one e.mail you have given me the courage to run out and buy the iceberg! Thanks David. Off to the super . I love that you love crisp bacon! This is such a great presentation for a salad. Love the photo! This is one of my favourite salads. I am so happy to see it making a comeback. THANK YOU for a blue cheese dressing without the MAYO. I despise MAYO. I often whip up a blue cheese viniagrette, but this sounds better without the added oil. Found it as I was in the middle of a bag of Sahale Tuscan Almonds, which I believe would taste awesome on top of this wedge! Every picture in this post looks so amazingly good I can’t stand it! I’m in the camp of those not feeling the iceberg here. I grew up in the 50’s and 60’s and about the only fresh green thing we had in the winter was iceberg lettuce (well, except for brussel sprouts and cabbage; we won’t go there because my mother was in the “cook it until it disintegrates” school of culinary practice). I’ve had way too much iceberg smothered in that bottled orangey “French” dressing, so delicious as the blue cheese sounds, I’m going to pass. Iceberg’s got great crunch, though. I do like it in tacos. However, next time I want a blue cheese dressing I’m going to try yours. Mix this with less crunchy greens and you’ve got the base for a pretty good chef’s salad here (if you like that sort of thing). The bacon fits right in; perhaps a touch of ham, hard-boiled egg slices. Something to work on . . .
mm blue cheese. i want to put this on everything. EVERYTHING! When it comes to wedges, the crisper, the better. A few hours before you want to eat, cut out the core, remove the leathery outer leaves, and soak the heads in icy icy water for 30 minutes or so. Drain for a few minutes with the cored side down. Refrigerate, still with the cored side down, to allow more draining and crisping. Despite years of trying, I just don’t care for blue cheese. I prefer to top my wedge with real homemade ranch or real homemade thousand island. Both made with Kraft mayonnaise ONLY. Or, perhaps a variation of BCD made with goat cheese? hmmmmm Bacon is nice but not necessary. Although the iceberg looks delicious and there’s certainly nothing wrong with eating it once in a while, I feel I must come to the defence of the dark green leafies. We get a fantastic range of Chinese greens in New Zealand, and as well as being nutrienty, they’re yummy. Although the Chinese don’t eat them raw in salads, I do, which removes the flop factor you can get when they’re steamed. Choy sum, in particular, is divine in salads. Hi David! Glad you’re back safe from Mexico and Texas (new slogan: “Smuggle Lemons, Not Guns”?) Strange reaction from the French who believe there’s a philosophical distance between salad dressing and sauce (though pouring hot cheese sauce on lettuce probably wouldn’t be that great, I’ll admit). I like more cheese flavor and less fat so I go with yogurt instead of sour cream (and definitely no mayo) as well as the lemon or vinegar, and I usually grate in a (very) small clove of garlic too–somehow the tang plus the garlic gives the bleu something to think about and play off of without the added salt. Also I don’t see that anyone so far has mentioned just letting the dressing sit for a while–say an hour or so (covered, in a fridge) before serving. Both versions are ok but I think you get more blue out of your blue if you give it time to develop. I know you’re not going with top-of-the-line 3-star bleus for a salad dressing, but still, you might be able to get more flavor from less bulk weight of cheese, and the dressing’s also better and different, more integrated, the next day. When you’re finally out of iceberg, what about a red cabbage wedge and some red peppers or pears with this? Toasted walnuts? 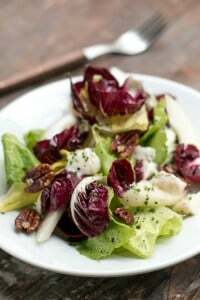 JA: I’ve never found or thought of Iceberg lettuce as bitter, but it did fall out of favor when things like microgreens and mesclun (mixed baby greens) started becoming more widely available. Recently I realized that I prefer salads with large crunchy things in it, like grated vegetable salads and radicchio and arugula sorts of things, but it was fun to re-connect with Iceberg, too. DebbieN: Well, if you think about it, it is a bit unusual to pour thick dressing over lettuce leaves. But to Americans, it’s often more about the dressing (Green Goddess, Caesar, Blue Cheese, Ranch, etc..) than the actual lettuce or salad. I can’t think of a French salad that is more about le sauce than the ingredients. But if you know where to get a good one, there’s nothing like a great salade Niçoise or salad Lyonnais—frisée lettuce, bacon, and a soft-poached egg on top, which come to think of it, is kind of like a creamy ‘dressing’! Just to let you know, Dan Lepard had a recipe for English Muffins in The Guardian Guide to Baking, given away with The Guardian newspaper just over 3 years ago. 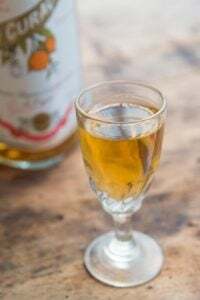 You can find it online under the title ‘Cider vinegar muffins’ at http://www.guardian.co.uk/lifeandstyle/2007/nov/24/foodanddrink.baking19 – it’s written for a British audience but I hope it’ll all be quite straightforwards. Strong white flour is our standard white bread making flour, easy-blend yeast is dried yeast usually sold here in small sachets, and a set of kitchen scales will make the recipe easier to follow. I made this yesterday with purple cabbage because I’m sorry, but I do not care for iceberg lettuce. I’ve had 4 “wedges” since yesterday. Yum. I used the buttermilk and plain yogurt option. I also added some shredded carrots because the orange with the purple made me happy and I candied almonds because candied nuts are yummy. Thanks for the inspiration! As I yelled “Salad, get in my belly!” I realized that sadly I have no bacon, no iceberg, no blue cheese, no buttermilk. Darn you, David. 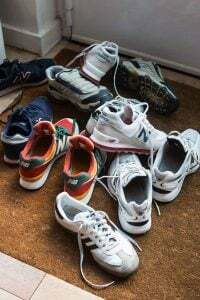 I’ll remedy this situation tomorrow! Looks very good! How can you go wrong with bacon? This sounds yummy, I’m going to try it out this weekend. Also wondering, what would you substitute for “crème fraîche” in French recipes, in general David? sour cream ??? It depends on the recipe but for US readers, full fat sour cream is the best bet when you can’t find crème fraîche. Mascarpone works in some instances as well, but isn’t quite the same thing. Hot damn – I know what I’m having for lunch! must try this dressing soon!!! This is the first I made Blue cheese dressing and I am shocked at how easy it is. Thx for the recipe, I really like it. Somehow everything else I have been eating up to now just does not taste as good anymore. I am not sure about iceberg wedge (am not a fan of iceberg, wedge or not), but I have tried this dressing on a few things already (broccolini, shredded carrots, unidentifiable lettuce, and just plain by itself)and I really like it. Again, thx and I hope you keep writing about lots of yummy things for a long time. P.S. I read your latest book and I thought it was helarious. I told about it to my mom and she said Paris is just like Russia. True story. 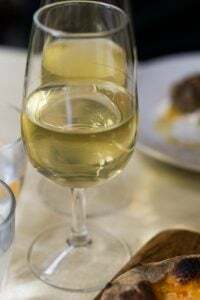 Sitting at our favorite bar at our favorite seafood restaurant, slurping down oysters and drinking chard, along came a skinny suburban mom – size 0 – who sat down beside us. To go with our slurping & sipping we needed some crunch and ordered their giant “wedge o’ lettuce” – complete with dressing, bacon, tomatoes and a scattering of croutons. Skinny suburban mom looks over at us and disdainfully – but with a hint of envy – says “are you going to eat all that?” Summoning my kindness for rude strangers voice I said we were treating ourselves to the dressing covered wedge and sharing it…she replies “well I guess the lettuce is just a vehicle for the dressing isn’t it?” With that she went back to her lemon water and broiled fish with steamed veggie dinner. Her comment made me love that salad all the more — size 0 be damned! PS – I now have my Valentine’s menu, oysters, chard, wedge and a chance to reminisce with my hubby. I made this last night, and it is everything I want dressing to be. Extra delicious on a baked potato with some butter and bacon, though probably less healthy than lettuce. 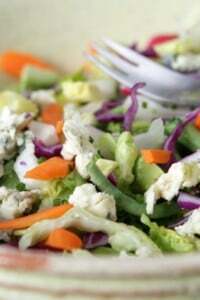 I am going to have to try this blue or bleu cheese dressing this weekend, I really love blue cheese dressing. Bambi: Can never comprehend why someone would want to go out to eat a restaurant and order bland food. Really what is the point just stay home and let the rest of us enjoy our decadent meal in pleasure. Thank you for this recipe! I made it last night and it was the best part of my meal (besides my Willamette Valley Pinot Noir) – I oversalted my lamb chops and roasted my baby reds a little too long, but my iceberg wedge with blue cheese and bacon was divine. I used a really pungent Blue cheese from Trader Joe’s, Daisy sour cream, and local buttermilk. I will never buy blue cheese dressing again – I was buying Marie’s since we can’t get Bob’s in Portland, but now I have even better! Can you believe that I actually GROANED when I first laid eyes on the picture?! I love that salad so much! When we lived in Paris for a semester (rue Pascal … 13th Arr.) I used bacon all the time, for a myriad of dishes … especially a tomato pasta that a transplant draft-dodger from Israel taught me to make. Luckily we have a terrific butcher who sells the nicest bacon, and lovely bleu cheese in the local farmer’s market, so this dish is in my very near future.